Happy Fall to all of our friends, we hope you're taking time to enjoy all that nature has to offer! 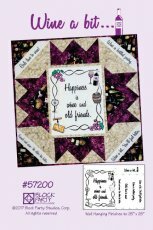 I would like to send out a BIG Thank You to all who came out to enjoy the last AQS/DesMoines Area Quilt Guild show. We are sad to see it end, but it went out with a bang! A special thank you to the Guild Members who volunteered to booth sit so vendors could take a break-you are indispensable! **Remember-visit our showroom to use your 20% off coupon valid now through December 31, 2017-good for in-store, in-stock merchandise! Busy, Busy, Busy. All of us here at Block Party have been running around like crazy to prepare for Fall Market! Dani & her husband will be leaving early Tuesday morning headed for Houston, TX. 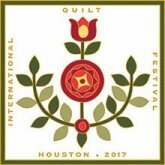 Can you imagine, after all the flooding and what goes with it, thousands of quilters from around the world will be invading their city! 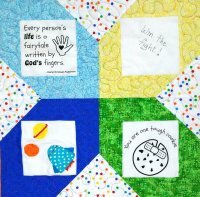 Just goes to show...there MUST be some SERIOUS quilter's in Texas!! 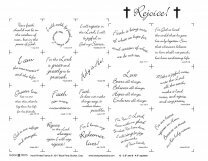 "Rejoice!" 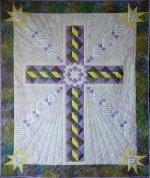 Rejoice is our new faith-panel, it has a coordinating pattern also entitled Rejoice! This panel & pattern is truly stunning... great job Dani! We have both pattern/panels ready & waiting for you!! 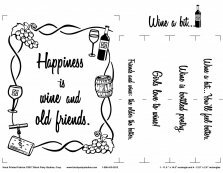 "Wine A Bit..."which is another of our new panel/patterns! That's right, you asked, we made it! It's awesome, take a look! Stay strong little ones, you're not alone! 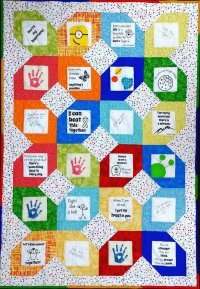 Like it's predecessor, "What Cancer Cannot Do"," Let's Fight Together" has it's own adorable pattern free on our website, www.blockpartystudios.com. 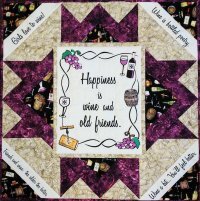 Quilt Festival is the week after market, November 2-5th, our booth is # 106. Please stop & catch up with Dani, I think she gets lonely without the rest of us! Thank you for keeping up with our going ons and we hope everyone has a wonderful fall and don't forget, it's time to start those Christmas gifts!